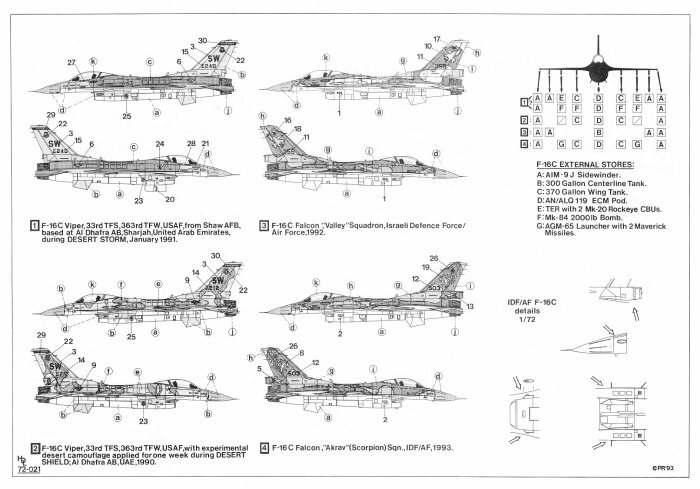 This sheet offers the modeller 4 very interesting decal options including two Israeli F-16's....a USAF Desert paint scheme from the Operation Desert Shield as well as another USAF F-16C from during Operation Desert Storm. 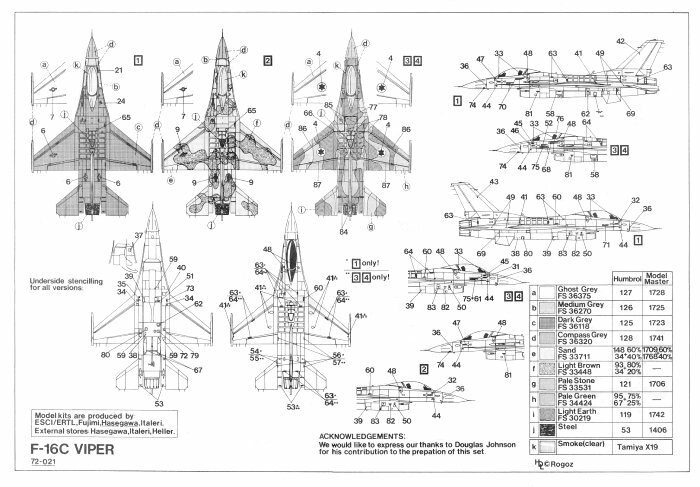 There are enough stencils included to do one of the four F-16C's featured on this sheet, although with additional stencils all 4 F-16's could be made. The first decal option is for a F-16C Viper of the 33rd TFS, 363rd TFW, USAF from Shaw AFB. This plane was based at Al Dhafra AB, Sharjah, United Arab Emirates during Desert Storm. This jet is Dark Grey (FS 36118) on the topside and Medium Grey (FS 36270) in the vertical stabilizer and Ghost Grey (FS 36375) on the underside with a Compass Grey nose cone (FS 36320). The second decal option is for a F-16C Viper of the 33rd TFS, 363rd TFW, USAF with experimental desert camoflage that was applied for one week during Operation Desert Shield at Al Dhafra AB, Sharjah, United Arab Emirates 1990. This jet is Sand (FS 33711) and Light Brown (FS 33448) on the topside and Medium Grey (FS 36270) and Ghost Grey (FS 36375) on the underside with a Compass Grey nose cone (FS 36320).  The third decal option is for an Israeli F-16C Falcon From "Valley" Squadron, of the Israeli Defence Force/Air Force in 1992. This jet is Pale Stone (FS 33531) and Light Earth (FS 30219) on the topside with some Pale Green (FS 34424) on the tip of the vertical stabilizer and Ghost Grey (FS 36375) on the underside with a Compass Grey nose cone (FS 36320). 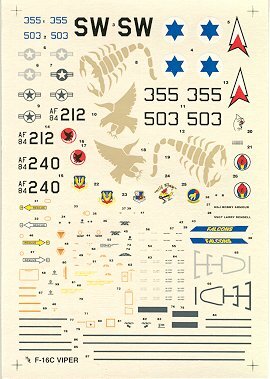 The fourth decal option is for an Israeli F-16C Falcon From "Akrav" (Scorpion) Squadron, of the Israeli Defence Force/Air Force in 1993. This jet is Pale Stone (FS 33531) and Light Earth (FS 30219) on the topside with some Pale Green (FS 34424) on the tip of the vertical stabilizer and Ghost Grey (FS 36375) on the underside with a Compass Grey nose cone (FS 36320).